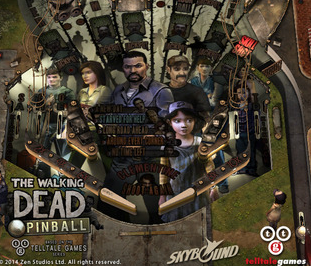 The Walking Dead Pinball captures the atmosphere of real-life pinball machines. The player has to keep the ball on the play-field by using the flippers and occasionally by slightly nudging the table. Each target, loop and ramp scores a certain amount of points, and there are special modes that can be triggered by specific methods on each table. During these modes the rules change and special shots or combos are available. The flashing lights on the play-field and the messages on the dot matrix display always tell which way to shoot the ball. To activate the flippers tap anywhere in the lower left or right corners of the display. Timing your action you can shoot ramps, orbits and targets with the ball. Each ball can be launched to the play-field manually with a plunger on the right side. Pull the plunger back to adjust the strength of the launch. The table has a skill-shot that rewards the player for a launch with appropriate strength or timing. There are 8 views in the walking dead pinball to follow the action as well as a free view option to expre the depths of the play-field. Pressing the change view button activates the free view mode, which allows the player to look around by tilting the device. Local Hotseat mode allows up to four players to compete on the same device following the classic arcade rules: the turn passes after a ball is lost. Please note that the walking dead pinball achievements are not accessible if you change table settings in the operator's menu.